Submitted by keenan on Mon, 2008-06-23 10:18. Submitted by keenan on Tue, 2008-06-03 18:36. Fixing the U.S. passenger railroad system is probably the one project we could undertake right away that would have the greatest impact on the country's oil consumption. The fact that we're not talking about it -- especially in the presidential campaign -- shows how confused we are. The airline industry is disintegrating under the enormous pressure of fuel costs. Airlines cannot fire any more employees and have already offloaded their pension obligations and outsourced their repairs. At least five small airlines have filed for bankruptcy protection in the past two months. If we don't get the passenger trains running again, Americans will be going nowhere five years from now. Read "Federal Government Remains Hostile to Rail Boom"
Submitted by keenan on Fri, 2008-05-23 10:34. "One way to address road and air congestion is by expanding our passenger rail system," said Rep. Bill Shuster, (R., Pa.), the ranking Republican on the House railroads subcommittee. Rep. James Oberstar (D., Minn.), chairman of the transportation committee, called the vote a historic milestone. "We ought to at least do in America what has been done in France to promote passenger rail service," he said. The slow-moving U.S. rail network pales in comparison to the popular high-speed routes in Europe and East Asia. But hints of change are emerging. California is poised to vote on a ballot measure this fall that would steer over $9 billion toward the development of a high-speed route stretching from Sacramento to San Diego. Several Midwestern states have teamed up in the Midwest Regional Rail Initiative, which aims to speed up service times between Chicago and cities such as Detroit, Cincinnati and St. Louis. The federal bill that advanced in the House Thursday would provide nearly $1.8 billion in grants to develop rail corridors between cities where trains can travel up to 110 miles per hour. 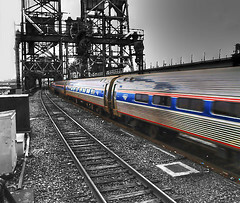 Another provision of the bill, championed by Rep. John Mica (R., Fla.), would have the Transportation Department solicit proposals for high-speed service along the heavily traveled and densely populated New York to Washington, D.C., route. Mr. Mica's goal is to offer consumers a rail option that would connect the cities in two hours. It takes 2 hours and 45 minutes for Amtrak's fastest train, the Acela Express, to cover that distance. Submitted by keenan on Thu, 2008-04-10 09:25. Doors opening on a moving train? Train cars decoupling mid-trip? According to an article in today’s New York Times, New Jersey Transit is stretched so thin to keep up with record demand that many experts are wondering if it is cutting corners on maintenance. That is pretty much the state of the nation’s transportation infrastructure according to two experts who spoke at the MAS last night in the first of our programs on Moynihan Station. Phillips provided a global overview of the transportation crisis and discussed how Europe, Asia, and even Mexico are placing massive investments in their infrastructure. France, for instance, is building rail tunnels “like crazy” for trains that, in some cases, will be carrying trucks. Iran is on a rail building boom. And Mexico is building a huge new port and rail network to compete with the Port of Los Angeles. But “we have no vision at all,” said Phillips. “All we can say now is no new taxes.” He blamed the federal government for not spending a dime on passenger rail, but explained that some states and cities are getting around the problem to build small intercity networks. We have previously covered Mayor Bloomberg's efforts to draw attention to the infrastructure crisis through his new group, Building America's Future. Walter Zullig, legal consultant and counsel emeritus, Metro-North Railroad, followed Phillips by pointing out that each commuter rail in the city, LIRR, Metro-North, and NJ Transit, is experiencing all time high numbers of daily riders. Amtrak continues to break records – even turning some people away – despite the fact it cannot afford any new equipment. “I don’t know how they do it,” he said. Zullig then provided an overview of the major metropolitan region rail projects: LIRR East Side Access, Second Avenue Subway, 7 line extension, ARC, Tappan Zee Bridge, and Moynihan Station. Zullig noted that regardless of “what happens upstairs” in the Moynihan Station there is an urgent need for track and platform improvements. Regarding ARC, the trans-Hudson tunnel project and new station in Macy’s basement, Zullig said it would be “highly desirable” to bring the tunnels into Penn Station. Making the connection to Grand Central is “complicated building but could be done,” said Zullig. Many listeners learned a new term when one audience member accused New Jersey of lacking the “testicular capacity” to do just that. If the transportation crisis is upon us what can we do about it? Our next Moynihan Station event features Jill Jonnes, the author of Conquering Gotham. April 23rd at 6:30. Click here for more information.